Most kindergarten kids love Halloween activities, so let’s take advantage of that and sneak in some learning at the same time. 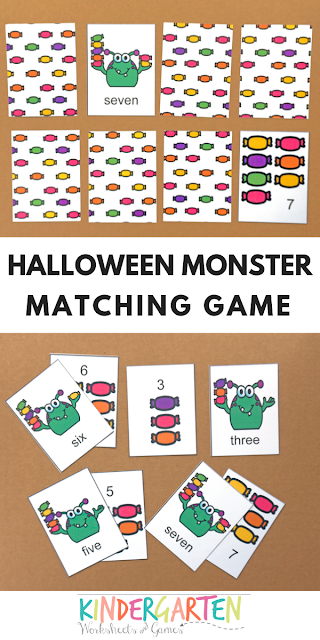 Help your students practice counting with this Halloween monster matching game. 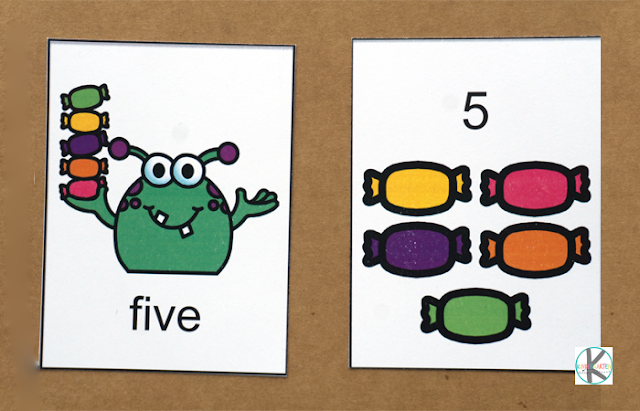 They will practice numeral and number word recognition with this fun activity. 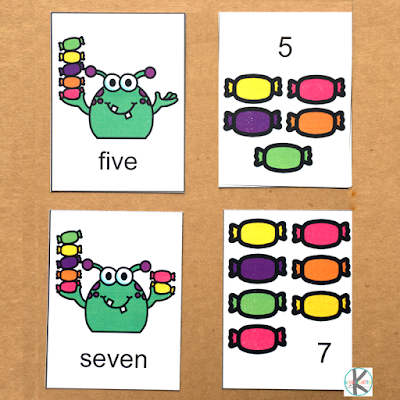 They will also be counting, so this is a perfect activity for younger learners. 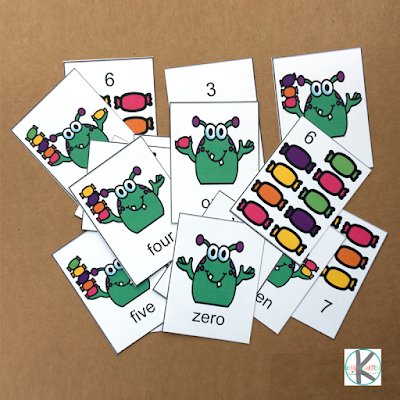 Students can play by simply matching up the number word and numeral cards side by side. Or they can play a traditional memory game where you turn 2 cards over trying to find a number and picture match. The idea is to match the number name with the corresponding numeral, so the card with the monster holding four Halloween candies is paired with the card showing 4 Halloween treats. The game is easy to play, and is perfect for students just starting to work on numeral and number word recognition. The best part about this game is its versatility. 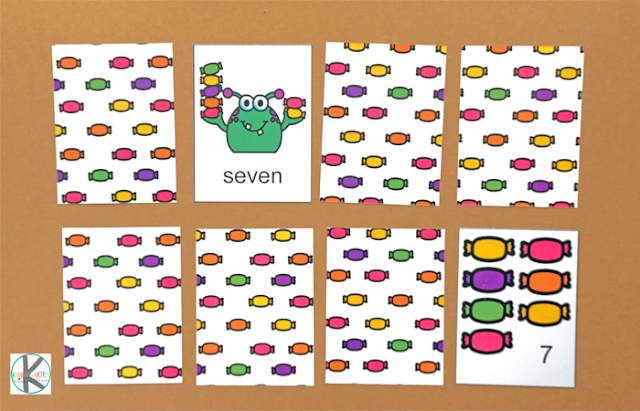 · You can use it in a math center or keep it as an early finisher activity. · Play individually or with a friend. All you have to do is download the file and print onto cardstock. The last page of the download is a design for the back of the cards. This is purely optional and you can certainly leave the backs of the cards blank if you wish. If you want two sided cards, just print pages 1-7. Then place them back into the printer and make 7 copies of page 7 on the back of the cards. I would laminate the cards, so they last longer, and then cut them out. That’s all there is to it! Easy Peasy! Now you are ready to play. For children just starting to count. 1. Sort the cards into two piles, a pile of monster cards and another pile of candy cards. 2. Have your child pick up the monster card from the pile, read the number word, and count the number of candies the monster is holding. Then find the card with the matching number of candies. 3. When your child finds a matching pair, place them in a separate pile. Challenge students to put the cards in number order as they find a match. You could go from zero to ten or from ten to zero. 1. Mix up the cards and place face them down in rows. 2. Invite the player to turn over two cards. The cards stay in the same place. 3. The idea is to match number words and numerals. 4. If the cards match, remove them from play and turn over two more cards. 5. If the cards do not match, turn them back face down. 6. Play continues until all the cards have been picked up. Hint: Try to remember where the cards are placed, so you don’t have to guess where the matches are. The first player turns over two cards as above. If the cards match, the player gets another go. If they do not match, turn them back face down and play passes to the next player. · Or cooperatively – how fast can you find all the pairs?